Part of being a successful reader of nonfiction means understanding the important information. This week, we looked at reading from the other side. We looked at the article No Drivers Wanted about robot cars. 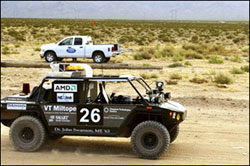 This is an article about the DARPA Challenge for driverless cars. 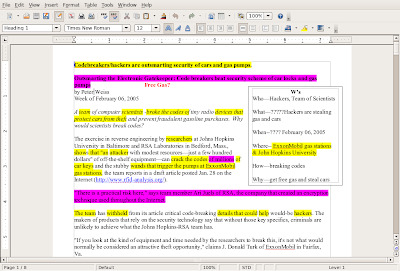 Students highlighted in pink, all of the information that wasn't important. Student partners went through the article and looked for trivial details, unnecessary adverbs and adjectives, and minor facts, opinions, and quotes that didn't help understand the article. Once the highlighting was completed, student partners were combined to make teams of four. The four students compared each team's work and discussed their decisions. 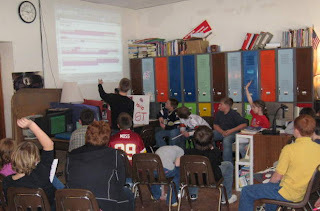 Scotty D. took over as the teacher next, and students looked at the article with the projector. With Brianne managing the computer, the class as a whole had to agree on what wasn't important. Today, students will use what text that is left as they search for the W's and write a gist statement. This is how the article looked when they finished. If you look at what is not highlighted, you should be able to see the important details, and get the gist. Tuesday, October 11—Stanley usually seems to know where he's going. 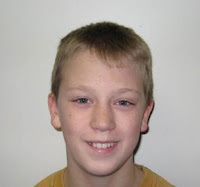 He moves quickly over rocky ground and across puddles. He works hard and he's almost always on the move. Stanley is a robot car. Last week, 23 teams—including the Stanford University team that built Stanley—gathered in the Mojave Desert in Nevada to compete in a special race known as the Grand Challenge. The race was special because none of the cars had drivers. Stanley completed the dangerous 150-mile course through the desert in six hours and 53 minutes, earning the Stanford team a $2 million prize from the Department of Defense. Of the 23 teams that competed, only five actually finished. The others were stumped by mechanical or technological problems. Sebastian Thrun, the lead robotics engineer for the Stanford team, realizes that driver-free, robot cars like Stanley still seem like something from a science-fiction film. "People by and large don't believe in this stuff," he said. "They've seen too many failures." This year's Grand Challenge was much more successful than last year's, when no vehicle was able to travel more than eight miles. What is important? What should we highlight? What are the W's? The students worked hard to drag the meaning out of an article, and here is what it looked like when we finished. 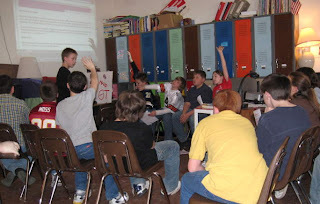 We used the DLP projector with a student leading the discussion, and a student operator on the computer.